A trip with George Soros. I am acting out a fantasy and so is Eastern Europe. A psychiatrist once told me how dangerous it is to act out fantasies and I am beginning to see what he meant. The snow was coming down so thickly on the deserted Romanian runway that even after you'd landed you couldn't really see where the sky stopped and the ground began. The feeling gradually subsided that the small rented jet carrying the world's most successful investor, George Soros, was about to become a pile of twisted hot metal. It was replaced by the specter of packs of ravenous wild dogs roaming the tarmac. “They were all over the place the last time I was here,” said one of the four female executives present from Soros's charitable foundation. “No,” said the woman beside her, “the last time I was here they were gone.” “Where did they go?” I asked, squinting through the window into the blur. A few feet forward at the front of the plane Soros looked back and with the air of a Romanian dictator said, “The people ate them for dinner.” Then he swiveled back his bouffanted Romanian dictator's head and smiled to himself. With the plane safely grounded and the wild dogs presumably consumed, the sole remaining anxiety in the cabin was that the tall, dark and troubled correspondent from French television seated beside Soros might finally lose his cool. Over the past week the Frenchman had grown frustrated with his inability to get the pictures to go with his story: BILLIONAIRE JEWISH AMERICAN SPECULATOR SINGLE-HANDEDLY DESTROYS EUROPEAN MONETARY SYSTEM THEN GIVES AWAY A FEW OF THE SPOILS TO MAKE HIMSELF FEEL BETTER. Thus far he had tried to glean sound bites from Soros about the financier's speculations (Soros himself, one of the world's legendary speculators, is no longer much involved in the markets), to obtain footage of Soros posing in the canyons of Wall Street (even while he was in the markets Soros rarely went to Wall Street) and to find ways to illustrate Soros's decadent billionaire's taste for luxe et volupte (Soros, though not quite so abstract as he would like to think, barely manages to generate a millionaire's interest in possessions). The day before, the Frenchman pouted for a whole hour while his two-person crew filmed one of the elementary schools in Budapest to which the Soros Foundation provides milk. As he tried to script a hundred or so Hungarian 10-year-olds, you could see him wondering about the consequences for his reputation if, after having been sent with specific instructions to bag a romantic global financial conspirator, he turned up in Paris with a dairy commercial. The Frenchman nicely illustrated the spirit in which Soros is often approached. Soros's extraordinary role, not only as the world's most successful investor but now possibly, fantastically, as the single most powerful foreign influence in the whole of the former Soviet empire, attracts far more suspicion than curiosity. The sorts of questions asked about him—Does he rig markets? Do central banks pass him inside information? What does he stand to gain out of Eastern Europe?—are rooted in the sense that he is not what he seems. (The questions that occur to one who takes him at face value are not necessarily nicer: Has he been smart or just lucky? Has he now completely lost his grip on reality? Do they make clothes for egos his size?) In the past few years a glittering array of powerful people has suspected him of something. The president of the European Community and representatives of the French and Belgian governments have accused him of orchestrating “an Anglo-Saxon plot” to undermine the French currency. The British government blames him for driving sterling from the European Monetary System. The United States Securities and Exchange Commission leaked allegations that Soros was near the center of Salomon Brothers' attempt to corner the U.S. government bond markets. On about as much evidence, the followers of Lyndon LaRouche have put him at the center of an international drug conspiracy; most recently they were spotted picketing Soros outside an economic conference in Bogota, which he did not attend. But the criticism he receives in the places he makes money is mild compared with the heat he takes in the places where he gives it away. 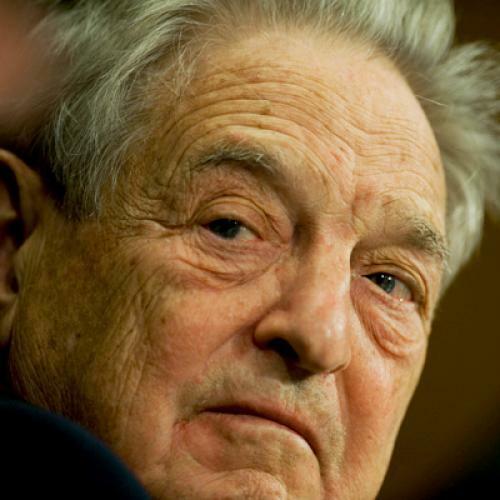 In the past three years Soros has spent or committed just shy of $1 billion to Eastern Europe. His portfolio of philanthropy breaks down as follows: two giant grants of $250 million each, one to transform the study of the humanities in Russia (training teachers, creating new textbooks, etc. ), the other to sustain a new university of his creation—the Central European University—with campuses in Prague and Budapest; $200 million to create and sustain his elaborate network of foundations; $100 million to encourage Russian scientists to stay in Russia; and $50 million in aid to Bosnia. As several publications have put Soros's worth at just shy of $1 billion, one can't help but wonder if the tank is running dry. “Actually I'm not spending as much as I would like to,” he said. “Oh, how much is that?” I asked. “One-half of my income,” he said, advancing slightly the theory that there are two kinds of famous rich people: those, like Donald Trump, who have much less than is commonly supposed, and those, like Soros, who have much more. He flew next to Sarajevo, to witness the opening of a water treatment plant he had built with $2.2 million from his Bosnian relief fund, and which in a stroke eliminated the biggest reason residents had for exposing themselves to sniper fire: the search for fresh water. From Bosnia he traveled to Croatia, where he met with (and publicly expressed his distaste for) President Franjo Tudjman. From Croatia he flew to the ceu's other campus in Budapest, where a regional elite of bright young people, above the squabble of national interests, is meant to be molded. There he hosted a two-day conference of midlevel geopolitical organization men—men entirely unlike himself—including the secretary-general of the alliance, a scattering of other Western diplomats and a dozen or so generals and cabinet officials of Eastern European countries desperate to be admitted to the alliance. I joined him in Budapest and watched with a growing sense of wonder as the bench-warmers of global politics deferred to the billionaire speculator. Then we clambered onto Soros's jet for a six-day tour of his offices in Timisoara, Bucharest, Chisinau, Sophia and Tirane. After a thirty-minute drive, we arrived at the language school, housed on the third floor of a Timisoara University building. What I was about to see I'd see so often in the next few days that I would soon grow inured to the sight. The truth is that by itself it did not mean very much. But it meant something. And multiplied several thousand times, as it has been by Soros's money, it may mean more than something. The building looked as though it should be condemned; the people inside were caricatures of hopelessness. Timisoara's university was a crackhouse without the crack. There was neither heat nor electricity. Pallid students with stringy hair stood listlessly in the foyer watching their breath turn into steam. We passed them and climbed the stairs. We glimpsed the inside of neolithic classrooms with light fixtures dangling from the ceilings and chalkboards dangling from the walls. We arrived on the third floor, scraped our shoes and passed through a glass door. It would have taken a harder heart even than mine to remain completely detached. It was as if this small corner of this black and white city suddenly had been given the gift of color by the touch of a magician's wand. There were new carpets, new furniture, freshly painted walls, a new copy machine and several dozen bright, smiling faces. The wry young Romanian clearly recognized whatever I was sensing. “Like traveling through a time tunnel, isn't it?” he said. A perky Romanian girl—a perky Romanian girl!—in an electric red sweater answered Soros's questions in what sounded like newly acquired English. “Qualitywise,” she said, “this is the best school in town, I daresay.” When, after the fall of the Berlin Wall, Ralf Dahrendorf wrote prophetically that “the key question [in Eastern Europe] is how to fill the gap between the state and the people with activities which by their autonomy create social sources of power,” he could have had this place in mind. In the next five days we would pass through a great many more social sources of power. Each stop would resemble the last. We'd land on some godforsaken runway and walk past an army into an empty vip terminal—the letters vip occasionally actually would be over the entrance. There we would be met by between two and fifty journalists. Soros would take a few questions, then leave to meet with the president of the country. He would then visit his foundation offices, invariably new, invariably run by some dynamic local already well on his way to becoming the most powerful nonparty political voice in the country, and convene with his local board members, among whom there seemed always to be a famous dissident, an aging ambassador, a young politician and a lady novelist long pegged by her compatriots to someday win the Nobel Prize. To everyone he met he explained that the foundation had grown so large that it needed a structure. He explained his cryptic new structure. He held a press conference for another pack of as many as 200 journalists. At some point, someone would ask him: “When will our country see light?” And Soros would say, “I like to think in Biblical terms, forty years.” Then he raced to the airport to get the jet to the next country. Really it's an astonishing performance, especially when you consider that three years ago Soros was not much better known in the region than any Wall Street drone. In Bucharest he will explain to a packed press conference that he did not meet with the Romanian president “for lack of time.” Late one evening after meeting with the president of Moldova in the morning and the president of Bulgaria in the evening he will turn to me and say, “You see, I have one president for breakfast and another for dinner.” And when I wonder aloud from the back of his jet how to illustrate in this magazine the comically complex web of his activities between Germany and China he will swivel around in his seat at the front and say, “Just write that the former Soviet Empire is now called the Soros Empire.” Then he will turn back around and smile to himself. Sometime in late 1980 or early 1981 George Soros had what he now describes as a midlife crisis. The Quantum Fund he managed had, between 1979 and 1981, quadrupled in size from $100 million to $400 million. Soros was a successful man, though nowhere near as successful as he would become over the next decade. “I had to recognize my success,” he says. “I had to ask, `Am I successful or am I the slave of my success?' I have to get some benefit out of it. Up till then I was under a very severe discipline of constant self-examination. Not taking anything for granted. So I relaxed my self-discipline.” And, for the only time in his career, he had less money at the end of the year than he had had at the beginning. The Jewish Council asked the little kids to hand out the deportation notices. I was told to go to the Jewish Council. And there I was given these small slips of paper. It was three or four lines. It said report to the rabbi seminary at 9 a.m. tomorrow morning. Bring a blanket and food for twenty-four hours. And I was given a list of names. I took this piece of paper to my father. He instantly recognized it, you see. This was a list of Hungarian Jewish lawyers. He said, “You deliver the slips of paper and tell the people that if they report they will be deported.” I'm not sure to what extent he knew they were going to be gassed. I did what my father said. There was one man I shall not forget. I took it to him and told him what my father had said. He said: “Tell your father that I am a law-abiding citizen, that I have always been a law-abiding citizen and I am not going to start breaking the law now.” And that stayed with me forever. By the fourth day of the trip the French television crew had grown bored with Soros and returned to Paris. A pair of local stations were on hand, shivering in thick down jackets, to suffer in its place. Soros had been scheduled to meet with a handful of students at Moldova University. But when we arrived—without Soros, his private talk with the president was running over—we found that the informal conversation had turned into a speech, and the handful of students had become 500 students and faculty inside a creaking, wooden auditorium. Moldova is a heatless nation; its weathermen should provide two temperatures, indoor and out. It was probably a blessing that about as many people were crammed into the space as could fit—students sitting on each others' laps, students sitting on railings, students levitating mysteriously along the back wall so that from the stage the room resembled a Pontormo crowd scene. The older professors sat together at the front of the room. According to the order of Moldovan minister of education, about 90 percent of the objects will be studied in all high schools of our republic in romanian language. What is your opinion on the fact that russian speakers will be not able to get high school education in their own language, and so many of them will have to leave high schools. Excuse my mistakes and thank you for the answer. The old men in the front now tried to get Soros's attention. They had spent a lot of the time shifting around uncomfortably, as Soros spun a vision of Eastern Europe that did not include them. Unlike the students, they hadn't submitted to the Soroscentric system of writing their questions out for his inspection. They insisted on addressing him directly. Several of them clutched copies of Soros's books. Oddly, these were not the two books he has written about the politics of the region, but his financial opus, The Alchemy of Finance, in which he first floated his theory of history. One of the old men rose and said, “Would you explain your reflexive philosophy of history?” Out of the corner of my eye I saw a foundation worker simulate an Edvard Munch scream. Humans operate with an inherently flawed view of events. There is no such thing as “social science” because the truth of social matters—a stock market, a political system, a love affair—is unobtainable. There are two reasons for this. The first is that people always operate with a bias, which is to say their view of social events is faulty because their view of social events is faulty. The second is that human thought changes the state of the world, which in turn alters human thought—a sort of Heisenberg uncertainty principle of life that Soros calls “reflexivity.” The inherent flaw in our understanding of social events can be small; Soros calls this a “near equilibrium” situation. Or it can be catastrophically large; Soros calls this a “far from equilibrium situation.” Such a situation can be stable or unstable. If unstable—Japanese real estate prices, communism—it eventually must be resolved more quickly and violently than it was created. Soros describes this sequence of events as a “boom-bust” pattern. Is that clear? I confess that after a half-dozen readings and an awkward attempt to get him to explain it to me I find his theory no more satisfying than when I first encountered it. As Soros concedes, it is of no obvious use to anyone trying to make money in the markets, and so does not prove that his success is a result of superior understanding. As he also concedes, it generates no testable hypotheses and so must remain forever a kind of metaphor rather than a true theory. But even as a metaphor it is more than a little weird. In what sense, for example, was the life of the Soviet system prolonged by people's misperceptions of events, rather than by brute force? Not surprisingly, Soros's attempts to ground his theories are sometimes almost painful to watch: “Participants are not detached observers,” he writes. “Their thinking affects the situation to which it refers. Perhaps the simplest example is the attitude of a married couple toward each other at the time of their wedding and at the time of their divorce.” Well, yes. What Soros does—or rather did; he now delegates the trading to his already legendary successor, Stanley Druckenmiller—is speculate. The Quantum Fund portfolio of about $4.5 billion—Soros began with $4 million in 1969—is sunk in a basket of stocks against which is set another basket of stocks sold short. Around this core Soros whirls dervishly. The fund risks not merely its principal, but also vast sums borrowed against the principal, so that at any one time Soros might have made bets equal to seven times the value of his portfolio. The bets generally arise from nothing more scientific than Soros's reading of the newspapers (in order of importance to him, The Financial Times, The Wall Street Journal, The New York Times). They tend to have as much to do with political as with financial events, and are likely to change daily. It was not uncommon for Soros to one day bet $1 billion that the yen would rise and the next, as the result of some finance minister's stray remark, bet $2 billion that it would fall. All of his extraordinary profits are the result of such giant gambles—what he calls “boom-bust types of investments”—paying off big. Until last year the single most famous gamble Soros made was an inspired disaster: just before the stock-market crash of October 1987 he wagered heavily that a crash was about to happen, but that the American stock market would come out of it better off than the grotesquely inflated Japanese stock market. The Japanese stock market alone was spared the crash, due to the intervention of the Japanese government, and The Quantum Fund lost about $800 million. Soros was wrong for the right reasons. But last March The Quantum Fund sold short against the deutsche mark about $10 billion worth of British sterling. The details of the transaction were complex but the essence of it was a gargantuan wager that sterling would withdraw from the ems. Although Druckenmiller had initiated the play, Soros provided his religiouslike faith in his own hunches. “I told him to go for the jugular,” he says. “It's shooting fish in a barrel. As long as the barrel holds up you keep on shooting the fish.” (“It takes courage to be a pig,” Druckenmiller has said.) Other speculators joined in and at last the Bank of England proved unwilling to support its currency, and withdrew from the ems. In a couple of weeks, The Quantum Fund took profits of a little more than $1 billion. Soros's international financial activity is far less well-understood and far less easily evaluated than the “value investing” of, say, Warren Buffett, or, indeed, most other fund managers. Few studies of the sort that have been done in the stock market have been done to show that these new global markets are efficient. (Soros thinks that they are growing more efficient now that people are learning his theories.) Perhaps more interestingly, Soros's global speculation is entirely without the ethical foundations of investing. His activity actually mocks those who provide the long-term capital that fuels economic growth. From time to time you will hear professional speculators nattering on about their role in making markets efficient. Soros is refreshingly free of this sort of talk. While he believes that there is such a thing as good speculation, he also thinks a lot of speculation is destabilizing. Speculation is neither inherently good nor inherently evil; it just is. The ethical calculus shifts rather dramatically, however, when one ceases to speculate in currency futures and begins to speculate in people. And there is a sense in which Soros emerged from his midlife crisis of 1981 as a speculator in the human condition: he took a large long position in Eastern European intellectuals. “The same set of ideas is responsible both for my making of money and my giving it away,” he says. He was laying down a bet on political change. And in the most astonishing way, of course, he was right. On the heels of his midlife crisis, Soros had boyhood friends in Hungary put him in touch with Hungary's leading dissidents: Istvan Rev, Miklos Haraszti, the coincidentally named Janos Kis. Separately, Soros befriended a woman named Annette Laborey, who since 1974 had been running from Paris an underground network of nonconformists from the top to the bottom of Eastern Europe. “In those days,” recalled Laborey, seated beside me on Soros's jet, “the only capital was the network of confidence and trust. George came to me and said, `How much do you need?' And I knew I had to give an answer quickly. I said, `$10,000 would be really helpful.' He looked at me and he said, `Annette, you must think larger. '“ And for the next few years she did, funneling Soros's (anonymous) money into her network. The sense of having won a bit too soon already had led Soros into one midlife crisis. Once again he had won big and everything was about to shift around; but this time he was imbued with higher purpose. Who better to fill the void left after the collapse of an ultimate truth than a man who had built a life on the idea that the truth was unobtainable? Soros's thousands became Soros's millions and Soros's millions became Soros's tens of millions and finally there emerged from the rubble of his prerevolutionary activities a far more nebulous and awesome operation of 800 people in forty-five offices strung across twenty-two countries. Its sense of purpose came in part from having turned itself into a kind of metaphor. As he criss-crossed Eastern Europe Soros explained to audiences that his foundation was a microcosm of open society. And at the center of that society sat a self-styled outsider—Soros himself—financing every oppressed minority he could find—Jews, intellectuals, Gypsies—and insisting on his, and by implication, their, right to be tolerated. “You can't tell people how to be pluralistic,” says Laborey. “You have to show them.” And so it is that an enterprise that began in perfect anonymity arrived at almost perfect egocentricity. By the end of the last day of the trip Soros had awed Albania, and nearly rid himself of all traveling companions. There were just the two of us left on board his jet, scheduled to fly from Tirane to Vienna, and I arrived first and took my seat in the back. Soros at length boarded, then had a sudden thought. “I think I want to go to London instead of Vienna,” he told the pilot. The pilot had just completed two hours of preparation for a trip to Vienna. “Mr. Soros,” the pilot said, “you are the most challenging customer we have.” And Mr. Soros chuckled, as if he had just been told a good joke. We were going to London. I suggested to him that his view of the world might be a tad distorted by the fact that everyone around him is always seeking to please him. “But that in itself is very pleasant,” he said, “I mean, it's much more pleasant than if people want to annoy you.” Which is, of course, true. The billionaire speculator slept until we were over Sarajevo (you can still fly over and look down). Then he invited me to take the seat across from him and talk—mostly about his midlife crisis, as it happened. But what struck me more than what he said was what he heard. He is a peculiarly selfish listener. One has the sense that he does not even hear 90 percent of what he's told; and the 10 percent he does hear he colonizes so completely that you forget that it was you who said it. Just the day before we had been riding in the back of his limousine somewhere in Bulgaria, searching for some oppressed Gypsies to give his money to, and to make conversation I'd said, “You know, it's ironic that after a lifetime of criticizing and even destroying institutions you find yourself building this monstrous institution.” “I am aware of the irony,” he said, wanly. But as we spoke he suddenly assumed a tone that suggested he was about to say something fresh. “You know,” he said, “it is highly ironic that I am building an institution, given that I've spent my career....” His books are the same way—a lot of borrowing without many footnotes. Maybe one of the privileges of wealth is that it permits you to lead your life without attribution. Everything you say is of interest simply because you are saying it. For Soros that is more true now than ever before. Although he no longer makes investment decisions, his every financial utterance is treated as if it had $10 billion behind it. Were I to write that Soros predicted that gold is due to rise (he didn't) gold would rise the day the remark saw print. No wonder he is so possessed by his idea that people see the world imperfectly. It is merely a reflection of how the world sees him. Some number—possibly some large number—of lives will be prolonged because of Soros. Some number of people will live more happily. Yet Soros resists the obvious temptation to sanctimony in a way that he does not resist egotism and fantasy. He does not wish to be taken for a saint. When people—friends and enemies—try to describe him, they reach for characters from literature, and with reason. Literary characters remain shaded; they are either tainted virtue or touched-up vice. They are not saints. And neither will be Soros, if for no better reason than his inability to suffer the association. The club of saints is beneath him!